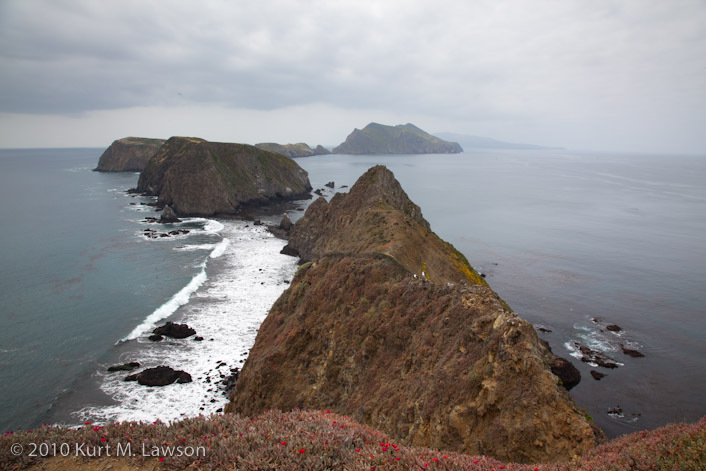 Yesterday I was supposed to spend the night on Anacapa Island, which is one of the islands making up Channel Islands National Park. This was very exciting since it was a new National Park that I had not yet visited and it was also my first time on any of the islands off the west coast. However, due to a series of unfortunate events we were unable to stay. Because we spent time setting up camp and were expecting to stay much longer, our time shooting photographs was tragically short during our stay on the island. Nevertheless I was able to bring back some keepers for sure, and our return to the mainland also provided some local opportunities for some fantastic images that will be in the next blog update. This is probably the most famous spot on the island, and a shot is pretty much obligatory. Despite my haste I’m really happy with this one. It’s a beautiful spot and I hope to come back and explore it further. I could literally spend all day looking at this view. The lighthouse on Anacapa as seen from our approaching boat. The coloring of the cliffs with bird droppings, plants and rock was very interesting. Just prior to leaving we took the boat around to the famous Arch Rock and around the corner to visit some sea lions. 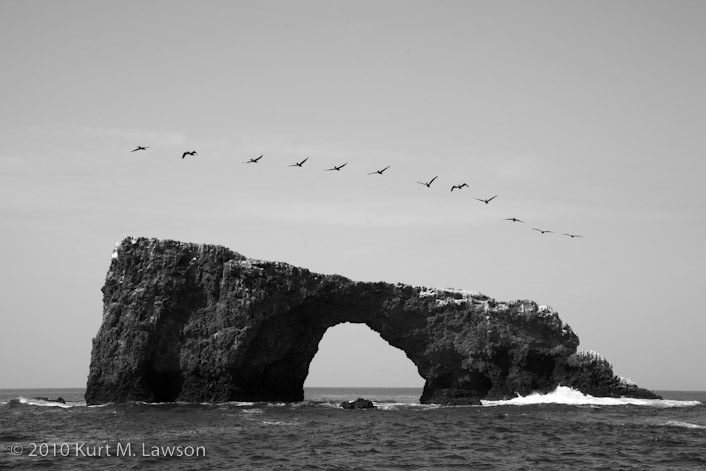 While we were there I spotted this string of pelicans approaching and managed to capture them right over Arch Rock. 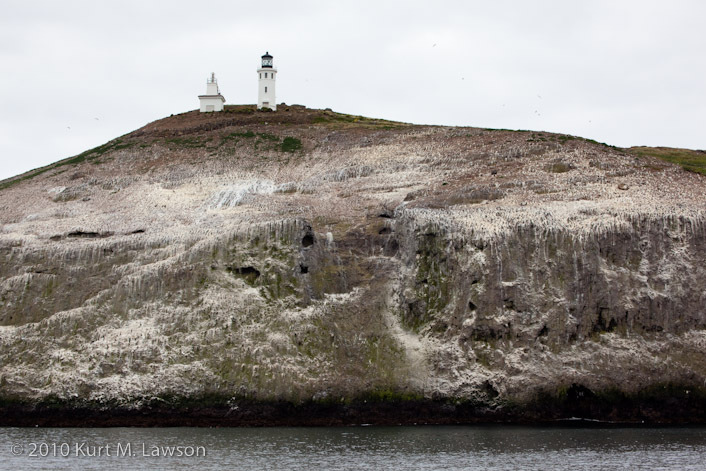 The only permanent residents of this island are Pacific Gulls. There are thousands of them. They are really everywhere on the island, and they make nest there in the spring. We were a little early for that but we did see some Gulls paired up here and there. Their sounds are inescapable on every part of the island. Normally I don’t think to shoot pictures of gulls but here they just ham it up for the camera. Along one of the trails was this set of wings. It was as if they were interchangeable parts and these spares were left on the ground. Oddly the rest of the bird was nowhere to be found. I wonder what befell the poor bird to have this happen. Perched on the 100 foot cliff edge, this gull leans forward to take off and escape the approaching photographer. On our voyage to the island we went around this huge cargo ship. It had this huge bow wave on the front, though it’s bulbous bow left little wake. Finally, here is a Pelican that glided past our boat. I’m always fascinated the ability of these huge birds to glide just a few feet above the sea. Marcia Lawson - Fantastic photos! Thanks so much for sharing! Your pictures are truly amazing. I love your blog and enjoy reading of your experience. You’re an inspiration! Heidi Lacey - Breathtaking photos. Your mother is so proud. She so lovingly shares your talents with me. I enjoy the beauty of your work.